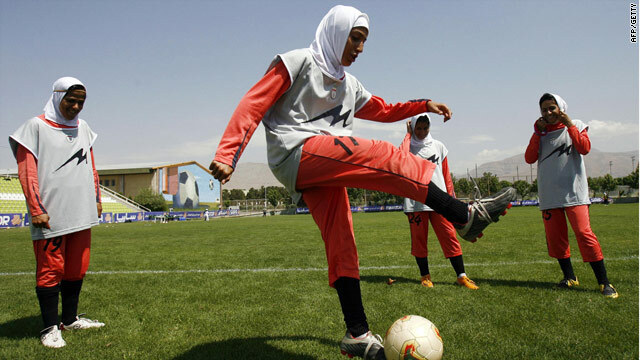 The Iranian women's team practice their skills. (CNN) -- World governing body FIFA says it will now allow an Iranian women's team to take part in the Youth Olympics if the players wear caps instead of the Islamic headscarf, the hijab. A row flared after FIFA barred the Iranian under-15 team from competing in Singapore later this year. FIFA cited their 2007 ban on teams wearing the traditional headscarves -- which protect the modesty of Islamic girls and women -- for safety reasons and to prevent political or religious statements. The decision came under heavy criticism, particularly in Iran, but in a statement issued on Monday, FIFA said the football federation of the Islamic Republic had agreed to a compromise. "This decision was taken after both the Iran Football Federation as well as the Iran National Olympic Committee confirmed in writing that they will accept a solution whereby the players will not wear their Islamic hijab during the matches of the competition," FIFA said. "Instead, the players can wear a cap that covers their heads to the hairline, but does not extend below the ears to cover the neck." A team from Thailand had been penciled in to replace the Iran team, but will now not compete. Around 3,600 athletes aged 14-18 are set to participate 26 sports, including football, at the first staging of the Youth Olympic Games, from August 12-25 in the south-east Asian city state.